Global Seafood Assurances (GSA), a new, independent, not-for-profit organization established to meet marketplace and public expectations for assurances across the board in aquaculture and fisheries officially launched at Seafood Expo Global in Brussels, Belgium, on April 25. The Global Aquaculture Alliance (GAA) spearheaded the formation of the organization and will initially fund its operations. The assurances which GSA will address relate to environmental responsibility, social responsibility, food safety and animal welfare for farm-raised and wild-caught seafood. Those assurances will flow from third-party certification programs that have been benchmarked by a combination of the Global Sustainable Seafood Initiative (GSSI), Global Food Safety Initiative (GFSI) and recognized social compliance programs. GSA will be open to any certification program that meets the benchmarking criteria above and that chooses to be a part of full supply-chain assurances for either farmed or wild seafood. GSA has already begun to address a major gap in fisheries certification by signing a memorandum of understanding with Seafish (the United Kingdom’s Sea Fish Industry Authority) to manage its Responsible Fisheries Scheme (RFS) in the UK. GSA will also work with other fisheries stakeholders around the world to develop new vessel standards for social responsibility. GSA is pleased with and will support the contemplated formation of the Global Fisheries Alliance (GFA) as it takes the lead role with developing international fishing vessel standards. The work of GSA with RFS program should serve to inform GFA on creating international vessel standards. Additionally, the GSA Seafood Processing Standards will be ready to go to market — after a public comment period — as the first and only seafood-specific processing plants standards for both farmed and wild seafood. Based on the Best Aquaculture Practices (BAP) Seafood Processing Standards, the GSA Seafood Processing Standards are comprehensive in that they encompass all four pillars of responsibility — environmental, social, food safety and animal welfare. It’s important to note that the work of GSA is not intended to result in harmonization of existing certification standards for aquaculture and fisheries but rather to represent critical assurances to the marketplace. Qualifying certification programs will continue to operate separately, though there’s the potential for realizing efficiencies through combining administrative- and service-oriented tasks such as traceability technology, data analysis, certification body management and accounting. Other needs that GSA will set out to address are improved traceability systems, cost containment through reduced audit duplication and outreach to smallholders. GSA’s objective is more credible assurances, more cooperative marketing and, ultimately, increased consumption of seafood, whether wild caught or farmed. GSA has launched a website at www.seafoodassurances.org. The Global Aquaculture Alliance is an international, nonprofit trade association dedicated to advancing environmentally and socially responsible aquaculture. Through the development of its Best Aquaculture Practices certification standards, GAA has become the leading standards-setting organization for aquaculture seafood. 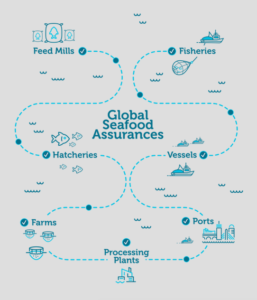 Talking Points: What is Global Seafood Assurances?